Student arrested after wearing gorilla mask to Black Lives Matter protest - We Resist. An East Tennessee State University student was arrested Tuesday week after wearing a gorilla mask and carrying a rope during a Black Lives Matter protest on campus, according to local reports. Tristan Rettke was charged with civil rights intimidation following the incident, according to a Johnson City Police Department report, WCYB-TV reported. 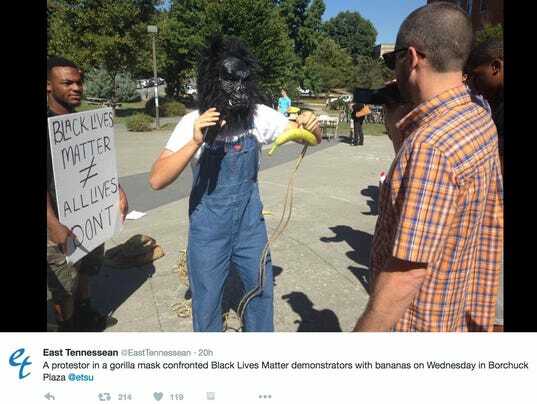 Earlier this week as students protested recent police shootings, Rettke walked amongst the crowd wearing a gorilla mask and offering protesters bananas attached to a rope, the East Tennessean, the university’s newspaper, reported. Grant Madison, a junior at the university, told USA TODAY he was talking with a friend when Rettke walked up behind him. Martin, who livestreamed the incident on Facebook, said the young man stood there and taunted protesters for 15-20 minutes. East Tennessee State University Public Safety officers eventually led Rettke, who was also carrying a burlap bag with a Confederate flag on it, away from the protesters, Martin said. University President Brian Noland said he was “saddened” by the incident at a press conference Wednesday. “We are exceptionally proud of the students who were peacefully participating in the event and the manner in which they exercised restraint, thoughtfulness and strength in the face of inappropriate and offensive behavior,” Noland said in a statement. Martin said students gathered Tuesday night to talk about the incident on campus. He said that many of the students involved in the protest have forgiven Rettke.